Nearly 60 years ago, sci-fi scribe Ray Bradbury put the "lit" in literature when he opened his dystopian exploration of censorship Fahrenheit 451 with the memorable line "It was a pleasure to burn." In the classic fable of a world without books, "firemen" of the future pump kerosene onto pulp, thus keeping dangerous ideas from impressionable minds. (In an ironic turn, Bradbury's book was eventually banned itself.) 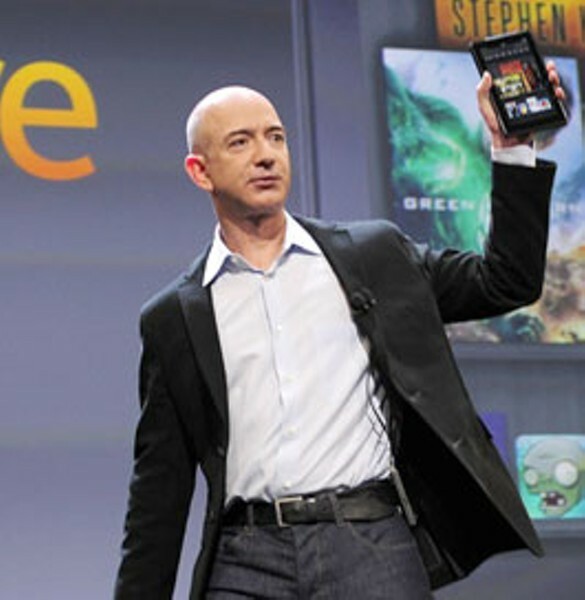 Now where there's smoke, there's also Amazon's latest addition of its e-reader line of products, the Kindle Fire. Unlike those in Bradbury's tome, Amazon's CEO Jeff Bezos isn't trying to do away with the dissemination of ideas so much as make it easier, or at least make easy money while making it easier, while obviating the need for print editions. Lauded as the first serious rival to Apple's iPad, the Kindle Fire is also a tablet device, competitively priced at around $200, about half the price of an entry-level iPad. This has led some to conjecture that Amazon's device is a loss-leader in the same manner that low mobile-phone prices are subsidized by their calling plans. If this is true, the use of ye olde "give them the razor, sell them the blades" business model suggests that once again content is king. Using 2010 sales data from major publishing houses, last March, Publishers Weekly released a study that indicated that ebooks are turning as many heads as digital pages. "Many top-selling authors on the 2010 hardcover chart are among the e-book top-sellers, including Stieg Larsson's The Girl Who Kicked the Hornet's Nest, with electronic sales of 775,000 compared to 1.9 million in print," wrote Daisy Maryles. This bodes well not only for the usual suspects of bestsellers lists but for newbies, who aren't often invited to the print party. The advantages of e-book publishing are manifold—it's cheap, the barrier to entry is low and there's no dearth of old and new content flooding into the ubiquitous ePub format. A universal electronic text platform, ePub was devised by the International Digital Publishing Forum as a "reflowable" device "agnostic" ebook standard, meaning it formats itself to whatever format one uses, from an Apple iOS device to Google's Android or anything in between. It's the mp3 of books. Given its price point and symbiotic relationship with the world's largest bookseller, the Kindle Fire and its e-reader brethren are both fanning the flames of retail-reading and hosing some much-welcomed kerosene onto the publishing biz. Surely, print die-hards will balk at the notion of reading on a digital device, but as Robert Frost wrote, "I hold with those who favor fire." Daedalus Howell's ebook 'Waxing and Wining' comes out in November.